The researchers used metabolomic and transcriptomic analyses to look at a particular bacteriophage (PAK_P3), which infects P. aeruginosa and has been studied for its use in phage therapy—using naturally occurring viruses to treat bacterial infections—touted as a potential alternative to antibiotic treatment. 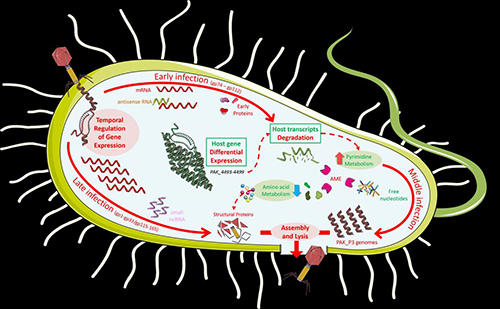 Since little is known about phage lifecycles, outside of a few model species, the research team measured bacterial and viral RNA transcripts and metabolites during a viral infection. The investigators found that the phage causes bacterial RNAs to degrade rapidly, then scavenges the available pyrimidine nucleotides for its own use. Moreover, the PAK_P3 phage uses RNA-based strategies to regulate its gene expression, employing antisense transcripts and small noncoding RNA. The new study combines “omics” techniques with traditional microbiology to give a detailed picture of how a virus subverts its host cell, both metabolically and genetically, to replicate itself. PAK_P3 is representative of a new group of viruses with promising characteristics for future therapeutic use, and its host, P. aeruginosa, is commonly multi-drug resistant, making it a desirable target for phage therapy. Before bacteriophages can be utilized effectively in medicine, however, a better understanding of their lifecycles will be necessary to establish protocols for their safe and proper use. “This work highlights the prominent role of RNA metabolism in the infection strategy of a bacteriophage belonging to a new characterized sub-family of viruses with promising therapeutic potential,” the authors concluded.